Get expert advice from hosts Jack Brittingham, Jimmy Houston, and Richie Bland as they discuss some of their favorite whitetail hunting techniques. Join Alex Brittingham as she takes three great bucks on ranches in East Texas and South Texas. This segment provides a great introduction to any young girl or boy interested in hunting. Watch incredible rutting action in Illinois as Jack Brittingham and Richie Bland hunt the peak rut period, and Jack takes a giant buck scoring 201 gross B&C. 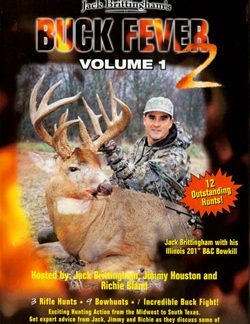 Listen as Jimmy Houston relates the events of his hunt for a huge Illinois monarch. 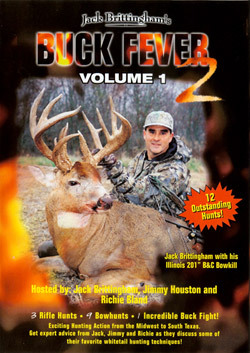 Pick up excellent hunting tips that helped him take this 170+ dream buck. 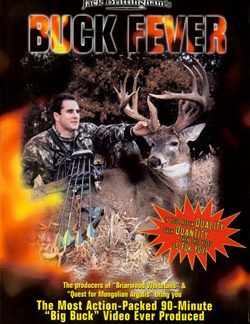 Feel the excitement as you enjoy an “over the shoulder” view of Mike Mireles’ hunt for the former Texas state non-typical record. The hunt for this unbelievable 189 gross B&C buck from the south Texas coastal plains is one of the most exciting we have ever seen! Be in the blind with Richie Bland as he takes an exceptionally wide south Texas eight point buck. View an outstanding fight sequence filmed at 35 yards! These bucks mean business! 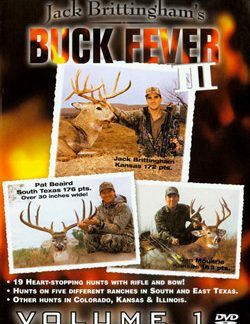 IMPORTANT NOTE: All of the proceeds from the sale of Buck Fever 2 Volume 1 on VHS FORMAT will go to a college fund for Mike Mireles’s two little children. For more information please visit mikemireles.org. Get expert advice from hosts Jack Brittingham, Jimmy Houston, and Richie Bland as they discuss some of their favorite whitetail	hunting techniques. 12 great hunts from the Midwest to South Texas! Watch Jack Brittingham as he arrows the largest buck ever taken on video, the new Texas State archery non-typical record: 249 gross B&C, 234 net B&C! Watch brothers Barron and Trevor Brittingham as they take two great bucks in South Texas. A hunt they won’t ever forget! See Alaskan Bill Sims as he hunts East Texas. On separate hunts he takes two bucks, both grossing over 180 B&C! View the action from Steve Moak’s hunt for possibly the biggest nine pointer ever taken on film! 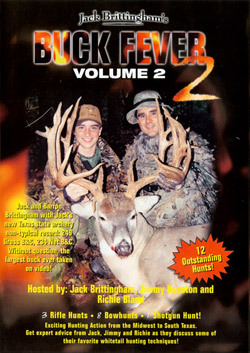 Join Jack and son Barron as they team up for a magnificent South Texas bruiser. Barron captures unbelievable footage as the buck comes to the antlers from 500 yards away! Feel the excitement during Tara Bertalan’s three day South Texas hunt. Tar hunts with both bow and rifle, seeing many outstanding bucks, and finally taking her best buck ever!